June « 2011 « Welcome to Property Source Nation! The Mushroom House For Sale! Steve Hausmann, host of Property Source Radio, makes his pick for the most unique home for sale in the Rochester real estate market. 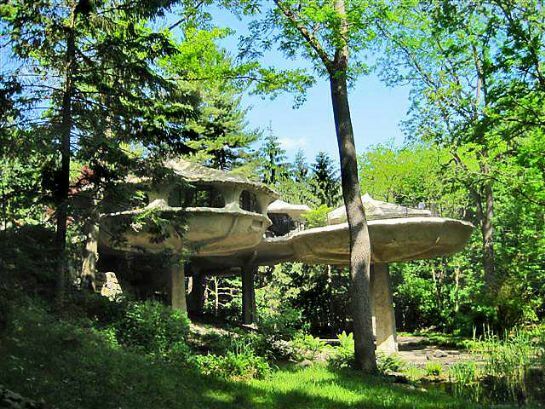 THE MUSHROOM HOUSE located in the town of Perinton. This secluded estate is listed by Rich Testa, Associate Broker with RE/MAX Advance. The list price – $1.1 million. See this listing in detail. House and Coyne welcome Joe Proia of Guaranteed Home Mortgage to Property Source Radio. Learn about the DOs and DON’Ts about financing in today’s market. If you are a first time buyer or a seasoned veteran, get pre-approved with Guaranteed Home Mortgage Company! Tune in to Property Source Radio this Saturday from 9-10am on Sportsradio 950AM ESPN or stream the show online. We all want to protect our valuable home theater electronics, computers and appliances from the risk of lightning strike, power surge, or brownout (a drop in voltage in an electrical supply). Most of us use power surge strips to protect our valuable electronics. Most of us don’t run our home’s appliances (washer/dryer, refrigerator, sump pump, etc.) through any kind of surge protector, which, if a destructive surge were to occur, could zap them out of commission. There goes a lot of money down the drain should you suffer from this happening and you having to replace these appliances. Patrick Coyne, local talk radio personality and Rochester entrepreneur, is marketing a device to Rochester residents and businesses that protects your whole house (or building) from power surges and brownouts. But in addition to power protection for your home, the ‘Power Miser’ device’s main selling feature is its technology, which reduces your home or business’s electricity consumption from the utility, lowering your electrical bill by up to 25% each month, while also helping the environment. The Power Miser unit gets professionally installed between your electrical meter and circuit breaker box. The technology behind the Power Miser unit is in its capacitors, which store electricity for use within your home or business. Appliances, especially those with inductive motors (such as air conditioning units, furnaces, refrigerators, freezers, dishwashers, washer and dryers, pool pumps, vacuum cleaners, hair dryers, and so on) drawing power straight from your meter is many times an inefficient process, wasting a good deal of electricity. The Power Miser’s technology supplies stored electricity to your appliances and electronics, reducing your demand from the utility. In doing so, your meter slows down and you use considerably less electricity. This causes you to have a considerable decrease in your electricity bill from your utility, and helps conserve the environment. Power Miser comes in several load capacities for residential customers, and depends on the size of the home and electrical panel environment. Power Miser models cost from $299 – $650 installed, and come with a 100% money-back guarantee. So, if Power Miser doesn’t cut your electrical bill by 10% within 90 days, they come and remove the unit from your home and refund your money. This alone shows that the device sells itself and you only have to pay for it if it works, where else can you get a guarantee like that? The company is so confident on its benefits, it’s taking all the risk in installing a unit into your home, that if it doesn’t perform, they’ll have to come back and remove. Coyne is co-host of “Property Source Radio,” with co-host Steve Houseman, which airs every Saturday morning at 9am on 950AM. Coyne’s Power Miser device is catching on fast as results speak for themselves and users are spreading the word, endorsing the product to their friends, family and to other businesses. To order Power Miser, call them at (585) 202-3590. You can go online to download the Power Miser PDF brochure and get more info. at: www.PMCecoSUPPLY.com. The experts’ say; the following are responsible for almost all of the emergency room visits related to simple hand tool operation. Wear safety goggles- eye injuries resulted in over 30,000 hospital visits last year with some resulting in the loss of an eye. Select and use the proper tool for the job – With many different categories of hammers and striking tools to choose from, be sure to select the one right for a specific job. Keep tools in good condition – Tools in good shape do a better job and are safer to use. Especially keeping hand tools sharpened. A dull tool is very dangerous because you have to apply so much more pressure to make it work. It then becomes unstable and can slip causing an injury. Never use a hammer with a chipped face or damaged handle – A loose hammerhead flying off a damaged handle is extremely hazardous. Likewise, if the face shows dents, cracks, chips, mushrooming or signs of excessive wear – discard it. That goes for any striking or struck tool. Educate all persons in the home on the proper use of hand tools – How a tool is used is just as important as what kind of tool you have chosen for a particular job. Tools should not be accessible to those who haven’t been briefed on their proper use and selection. Can you imagine trying to get a modern teenager to listen to you brief them on hand tool safety? And to actually pay attention! Alka Seltzer – It’s Not Just for John Carr’s Upset Stomachs Anymore! Alka-Seltzer has been around for 75 years, and was once hailed as a cure-all for indigestion, headaches and John Carr’s occasional bouts with destiny. Who ever would have thought that this over-the-counter health remedy could also be used to clean items around the home? 5) To unclog a drain, drop 3 tablets down the drain followed by a cup of white vinegar. Wait a few minutes, then run the hot water. 6) To clean thermos bottles, drop four Alka-Seltzer tablets into a thermos bottle filled with water. Let it soak for an hour before emptying. The thermos will be fresh the next time you need it. 7) To cleanse dentures, drop your dentures into a glass of Alka-Seltzer for about ten minutes. The citric acid and carbonation will remove even the toughest stains from your dentures and other prosthetic dental work. This is an excellent substitute for more expensive denture cleanser products. To cleaning Pots and Pans, drop six Alka-Seltzer tablets into pans with baked on-caked on grease. Dissolve the tablets. Let the solution fizz for one hour and then pour down the drain. Cook with clear, shiny pots and pans every time. Whether you are selling your current home, considering buying a new place, or just wish to give your abode a facelift, I have several ideas for you to boost your pride in your home. Your home should rise up to greet you, transform it to be the best home on the street. The first action should be to clean. Rid your yard of all debris, dead branches, leaves and ‘witches britches’ hanging from your shrubs. Purchase a power washer and spray your siding, shutters and gutters. Re-edge sidewalks, gardens, herb beds and then mulch. To keep weeds from growing up through the new mulch, lay down sheets of newspaper before spreading the new mulch. Rid your property of all seasonal stuff, like Christmas lights and wreaths. Replace with baskets of annual flowers and pots filled with herbs for cooking. Remember, you’re bringing in a new season. Whether attached to the front, side or back of your home, play up it’s detail. Plant climbing flowers like roses, clematis or morning glories and have them climb on lattice. If you don’t have lattice, tie strings from the ground to the porch ceiling so the plants can grow up and you will have created a living wall. Slipcover or buy new furniture cushions. I would re-think adding a row of white rockers, a la Cracker Barrel, but would consider adding a glider or hammock. I remember our front porch, where I grew up, in the 19th ward. It was a sanctuary. A place for neighbors to gather and play cards. Our porch was the stage for fun games, long before the invention of Xbox. We played ‘red light, green light’ and ‘movie stars’ from our front steps. We waited for the “Skippy man” to drive down the street, listening for his bells, awaiting a purchase of a ‘Buried Treasure’. It was a safe haven from big, scary dogs that roamed freely then. It was a place to storm watch and wait until puddles filled the streets so we could wade through them barefooted. It was the hangout to rest after we enjoyed a ‘street dance’ on a Friday night. Way back in the late 1800’s porches were slated as healing places. “Cure porches’ around Saranac Lake were places where city dwellers could heal from tuberculosis. There are about 180 of them on the historic register. Be proud of your home. Try a ‘bite sized’ project this weekend. Clean the yard, plant and mulch. If you are fortunate to have a porch, make real lemonade and a lettuce sandwich. Relax on your glider, grab your deck of Bicycles, and spy on your neighbors- it’s the only acceptable place. What Separates the Winners From the Others? Your success does not depend on how you respond to the good days. Your success depends on how you respond to the bad days. Winners fail. In fact, winners fail more often than others. That’s how they become winners. They learn and grow from their failures. What separates the winners from the others is how they respond to their failures and setbacks. Everyone suffers when they fail. After the failure do you get emotional and dwell on it? Of course, we all do that. The key is how long you dwell on it and what you do next to get past it. Winners suffer deeply but they get objective and refocus quickly. They quickly consider what there is to learn from the failure or setback. They look for patterns and connections to see if there is a systemic problem that can be corrected and lead to a significant improvement. Then they get back into action. They take action on the correction if there is such action to take. Then, quickly, they get on with what has to be done next to move their business forward with little or no residual “drag or delay” from the failure or setback. Consider Failures and Setbacks as Breakdowns: People have far more control over some breakdowns than others. A Real Estate Agent works hard to put a deal together and the Buyer is unexpectedly laid off from their job. You have less control over that than if the Agent had never asked about the Buyer’s employment and there was a problem that could have and should have been identified earlier. Either way, it’s a breakdown. Some setbacks are much harder to get past than others. My elderly neighbor’s teenage granddaughter was visiting. When the teenager got up at night to use the bathroom she turned out all the lights, not knowing her grandma always left one on so she could see. The grandma fell down the stairs and will be recovering and rehabilitating from her injuries for many months. Think of the grandma in recovery; the granddaughter’s guilt, and her parents struggle to help the young woman get past it. Some setbacks are much harder to get past. Creating Breakthrough Out of Breakdown: Like all successful strategies this is a system. It is a simple system. Do not confuse simple with easy. It is difficult to put into practice. It is difficult to practice consistently. However, once it is mastered it becomes a path to a life of greater courage, filled with breakthroughs and less fear of breakdowns. When you have setback, a failure, a breakdown there is a five step process that turns that breakdown into breakthrough. Acknowledge the error. Simply recognize and admit that, yes this happened or is happening. This may mean also recognizing and admitting the (sometimes dire) consequences of the error. Take responsibility for it. This means that you accept that you caused it. You do this even if it is unreasonable; even if it seems completely inaccurate. You do not have to tell anyone else that you take responsibility. You take this step for the purpose of taking control of your life and seeking the breakthrough. Forgive yourself and/or anyone else for the error. Forgiveness is an act and a sign of strength and confidence. In this system it communicates that sense of strength and confidence to you. It builds and expands your self esteem. Recommit to the goal…or not. In whatever endeavor the error occurred. Recommit to the effort. Or choose to end the effort. But, if the latter, make it a conscious choice. If you choose to recommit and in most cases you will, then if it is a lost Real Estate deal, recommit to your goals and career. If it is a habit or addiction recommit to your health and vision. As earlier if it is a tragedy, recommit to love and a life of purpose. As part of your re-commitment choose a deadline, a new deadline or timeframe. Get immediately back into action. You may get immediately into action toward the goal. Follow the famous advice, “Never leave the site of setting a goal without first taking some form of positive action toward its attainment.” And once you have taken that action toward your goal get back into action in your life, whatever there is to do next. The Real Estate business is one that can cause several areas of breakdown sometimes daily. A truly successful Agent can get past these opportunities for breakdown and learn from them to minimize the effect next time. Print this article, now. Highlight or circle the parts that you want to remember. Stick it on a wall or somewhere that you can find it so that when you have your next breakdown and you know it is inevitable. You can see whether there is a way to turn that difficult moment into the path to your next breakthrough.